With a heritage dating back nearly 30 years, TaxCalc has been trusted by hundreds of thousands of taxpayers to help them with their tax return. Whether you know your way around the returns or need a helping hand, TaxCalc provides you with both HMRC Forms and SimpleStep® questionnaire methods of entry. And when it comes to calculating the figures that go into the boxes, TaxCalc's numerous wizards and worksheets will help you make the correct choices and pay the right amount of tax. TaxCalc Partnership is based upon the same core technology as our award winning software for Practices, which are used by thousands of firms of accountants up and down the country. TaxCalc's support team is staffed by tax professionals who are on hand to help you fill out your forms. We are so confident in our software that there is no additional charge for support. Our lines are open from 9:30am to 5:00pm Monday to Thursday and 9:00am to 5:00pm Friday, with extended hours until 8:00pm in January. TaxCalc Partnership provides the partnership, the partners and their family members the correct returns for their affairs, complete with all necessary supplementary pages. We work closely with HMRC to ensure that your software is always up to date. tax years dating back as far as 2013.
file your partnership and individual tax returns by 31st January 2020 to avoid penalties. complete and file your tax return online to HMRC. TaxCalc Partnership is the simplest and most complete way to file your tax returns online. 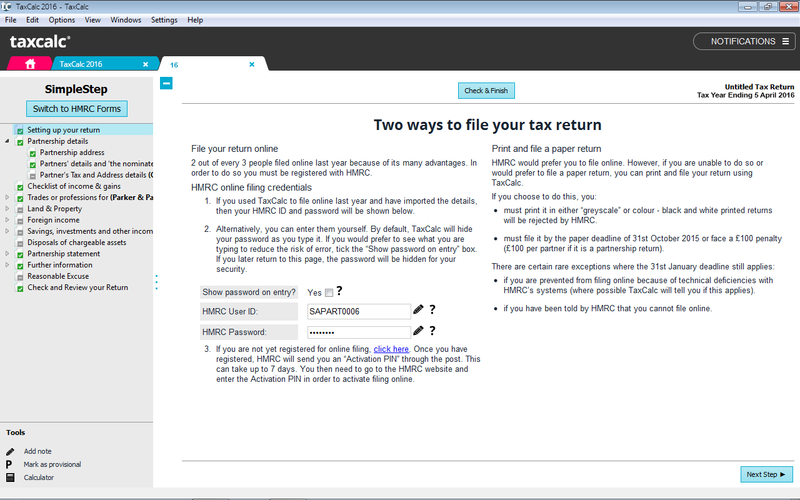 Fill out your return directly using HMRC Forms mode or let TaxCalc help you with our unique SimpleStep questionnaire mode. Use Check & Finish to validate your entries and address any potential problems before you file your return. 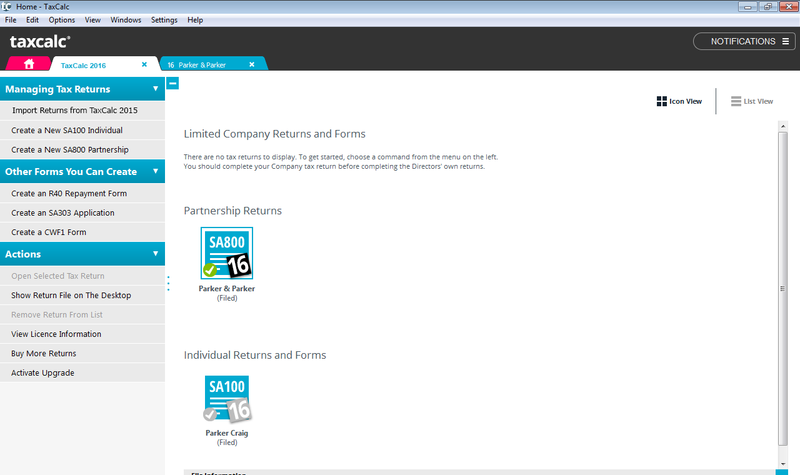 Link and import data from the SA800 Partnership return with the partners' own SA100 Individual returns. TaxCalc Partnership includes some other handy forms such as the R40 Repayment form and the SA303 Reduction of Payments on Account. TaxCalc Partnership can be upgraded with additional Individual, Partnership, Corporation Tax and Trust forms. Please call 0345 5190 882 to discuss your requirements. and functions to make light work of your tax return. Licence permitting, you can be confident of producing a complete tax return, regardless of your affairs. An internet connection is needed in order to license your product and to file online to HMRC. and review pricing when you come to buy your software. If you have a Trust and need to file a single SA900 Trust tax return, this add-on provides you with the form for easy on-screen completion and online filing. Income received from the Trust can be imported directly into the SA100 Individual tax return. If you have two Trusts and need file returns for them, this add-on provides you with a form for each, with easy, on-screen completion and online filing. Income received from either or both Trusts can be imported directly into the SA100 Individual tax returns. Make the entry of dividend data a snap with this database of FTSE350 and AIM listed dividend data for the 2018-19 tax year Bring forward your shareholdings from your 2017-18 tax return and TaxCalc Dividend Database will do the rest. The database is released in June each year to include dividends paid up to the end of the previous tax year. Use your 2018-19 tax return data to project your tax liability for the 2019-20 tax year. You can also create scenarios, adjusting your levels of income or to see the effects of decisions being made now on next year's tax bill. Applies to SA100 tax returns only. The add-on is released in June each year to include changes announced for the next tax year. 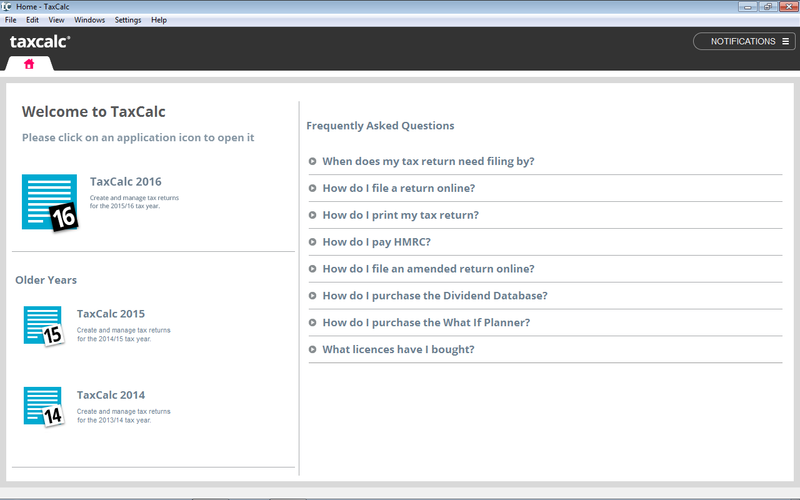 see how you use TaxCalc and see how easy it is to complete your tax return. TaxCalc organises and provides access to tax returns for the 2018-19 back to 2012-13 tax years*. TaxCalc manages the production and progress of your tax returns, together with additional supporting forms. TaxCalc contains two modes of entry. SimpleStep is our unique questionnaire mode, which guides you through the return, asking questions based upon answers given and data entered. 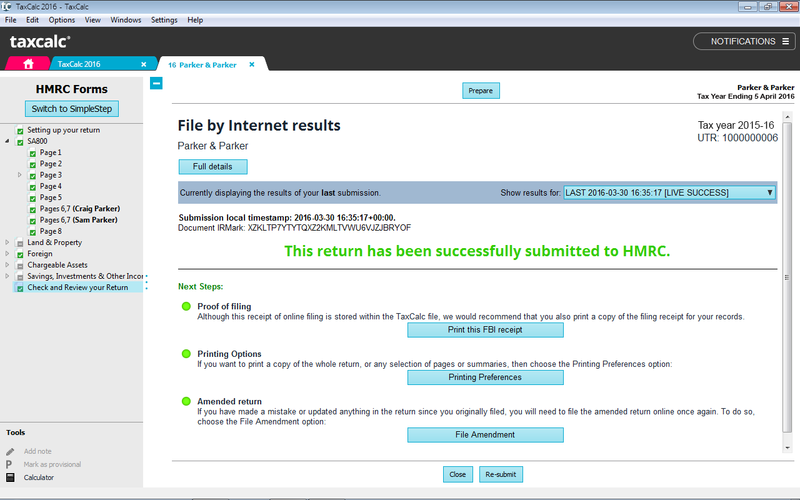 HMRC Forms mode displays a facsimile form for fast direct entry. When you get to the end of your return, Check and Finish validates the entries you've made and highlights any potential issues before you file. 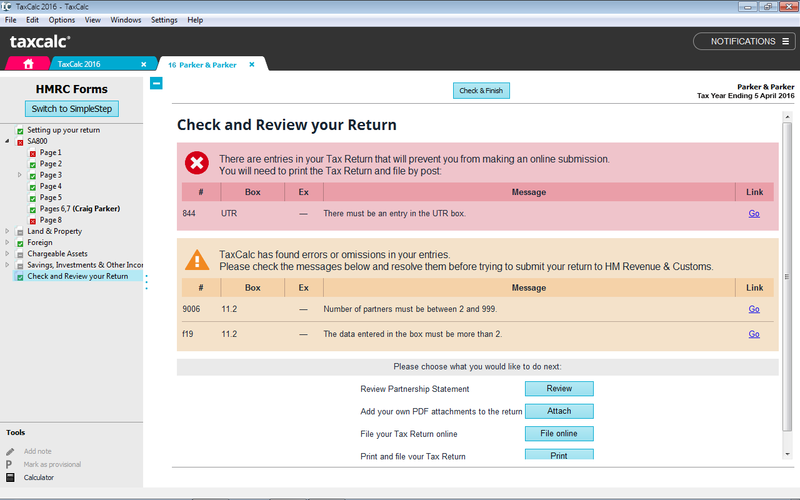 TaxCalc files online and tells you when your return has been successfully received by HMRC. *TaxCalc is sold according to tax years, each of which is bought separately. Please see our Versions and Prices for more info. The questions below provide immediate answers to many aspects of TaxCalc Partnership. Yes. 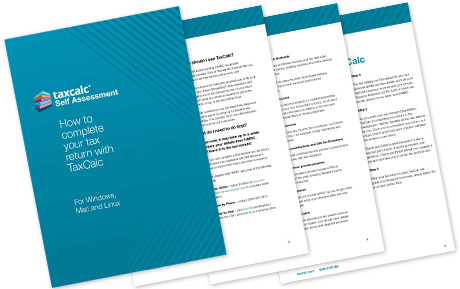 TaxCalc's software has been fully tested with Microsoft's latest operating system and we can confirm that it does indeed work with Microsoft Windows 10. For a full compatibility list please see the System Requirements for TaxCalc. Does TaxCalc work on Apple Macs? Yes. TaxCalc will run on any 64-bit Macintosh running Mac OS 10.12 or higher. Yes. TaxCalc will run on any 64 bit kernel 3.10 (or higher), Debian (e.g. Ubuntu) or Redhat based distributions. Do I have to buy the software every year? TaxCalc is an annual purchase because we have to redevelop it each year to new rates and tax rules. Your licence is perpetual and will continue to provide future access to unused returns for purchased tax years. Since TaxCalc is an all-in-one application, when you buy next year's licence, all you need to do is open TaxCalc and it will update itself to add in the 2018-19 forms. Can I upgrade or add additional returns? Yes. 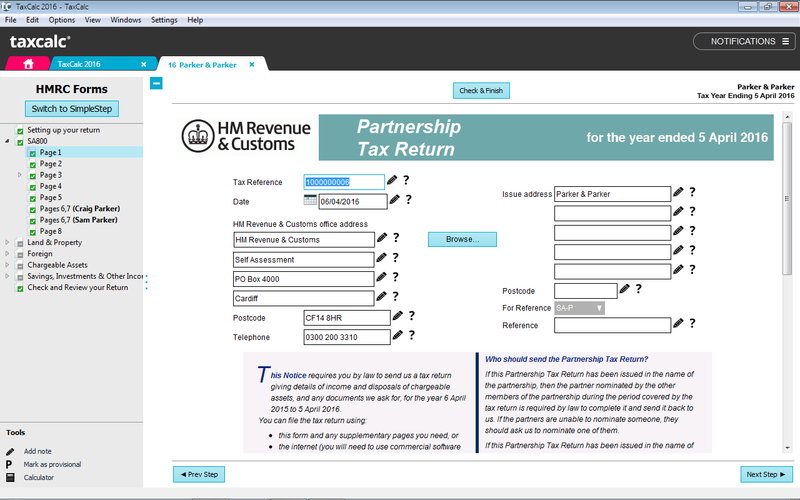 TaxCalc Partnership can be upgraded with additional Individual, Partnership, Corporation Tax and Trust forms. To discuss your requirements, please call us on 0345 5190 883 or email sales@taxcalc.com. Can I share licences with friends or family if I purchase a personal product? It is not possible to share/transfer licences to friends or family as this is solely for the use of the licence holder to complete all six returns. Any shared licences would be a breach of contract under our End User Licence Agreement (EULA) and could result in termination of contract. Can I buy previous years' returns? Yes. We supply tax software dating back to the 2012-13 tax year. You can find this on the Versions and Prices page. I install TaxCalc Partnership onto? For your convenience, TaxCalc Partnership may be installed on up to two computers. Please select from the options below to build your TaxCalc Partnership order. You will choose your operating system when you download your software. Prepare one SA800 Partnership return and up to six SA100 Individual tax returns for the partners of the firm and family members for the 2018-19 tax year. Includes all non-resident and other supplementary pages. This add-on provides you with 1 x SA900 Trust and Estate return for the 2018-19 tax year. This add-on provides a database of dividends of FTSE350 and AIM listed companies. Applies to Individual returns only. A new version is released in June each year to include dividends paid up to the end of the previous tax year. This add-on calculates a future tax liability for the 2019-20 tax year and enables the creation of tax planning scenarios. Applies to Individual returns only. The add-on is released in June each year to include changes announced for the next tax year. Looking for tax years prior to 2018-2019 tax year? Prepare one SA800 Partnership return and up to six SA100 Individual tax returns for the partners of the firm and family members for the 2017-18 tax year. Includes all non-resident and other supplementary pages. This add-on provides you with 1 x SA900 Trust and Estate return for the 2017-18 tax year. This add-on calculates a future tax liability for the 2018-19 tax year and enables the creation of tax planning scenarios. Applies to Individual returns only. The add-on is released in June each year to include changes announced for the next tax year. Prepare one SA800 Partnership return and up to six SA100 Individual tax returns for the partners of the firm and family members for the 2016-17 tax year. Includes all non-resident and other supplementary pages. This add-on provides you with 1 x SA900 Trust and Estate return for the 2016-17 tax year. This add-on calculates a future tax liability for the 2017-18 tax year and enables the creation of tax planning scenarios. Applies to Individual returns only. The add-on is released in June each year to include changes announced for the next tax year. Prepare one SA800 Partnership return and up to six SA100 Individual tax returns for the partners of the firm and family members for the 2015-16 tax year. Includes all non-resident and other supplementary pages. This add-on provides you with 1 x SA900 Trust and Estate return for the 2015-16 tax year. This add-on calculates a future tax liability for the 2016-17 tax year and enables the creation of tax planning scenarios. Applies to Individual returns only. The add-on is released in June each year to include changes announced for the next tax year. Prepare one SA800 Partnership return and up to six SA100 Individual tax returns for the partners of the firm and family members for the 2014-15 tax year. Includes all non-resident and other supplementary pages. This add-on provides you with 1 x SA900 Trust and Estate return for the 2014-15 tax year. This add-on provides you with 2 x SA900 Trust and Estate returns for the 2014-15 tax year. This add-on calculates a future tax liability for the 2015-16 tax year and enables the creation of tax planning scenarios. Applies to Individual returns only. The add-on is released in June each year to include changes announced for the next tax year. Prepare one SA800 Partnership return and up to six SA100 Individual tax returns for the partners of the firm and family members for the 2013-14 tax year. Includes all non-resident and other supplementary pages. This add-on provides a database of dividends of FTSE350 and AIM listed companies for the 2013-14 tax year. This add-on calculates a future tax liability for the 2014-15 tax year and enables the creation of tax planning scenarios. Prepare one SA800 Partnership return and up to six SA100 Individual tax returns for the partners of the firm and family members for the 2012-13 tax year. Includes all non-resident and other supplementary pages. This add-on provides a database of dividends of FTSE350 and AIM listed companies for the 2012-13 tax year. This add-on calculates a future tax liability for the 2013-14 tax year and enables the creation of tax planning scenarios. VAT will be calculated in the next step.